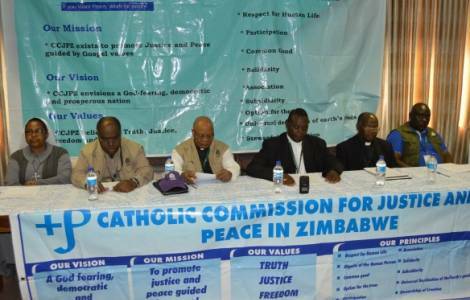 AFRICA/ZIMBABWE - Bishops appeal for dialogue: "Let us rebuild hope for a better future"
Bishops appeal for dialogue: "Let us rebuild hope for a better future"
Harare (Agenzia Fides) - We need to return to the spirit of November 2017 when hopes for a better future prevailed. This is the meaning of the Pastoral Letter of the Bishops of Zimbabwe sent to Agenzia Fides on the dramatic events that are shaking the Country, after the government announced the increase in fuel prices. The Bishops state that they have not published any previous declarations, denying the one published in recent days by the local press (see Fides 17/1/2019) "We are dismayed that our name has been abused in this way", they say. In November 2017 a military ruling deposed former President Robert Mugabe. Since then, the Country has been governed by Emmerson Mnangagwa, who had assumed the post of interim Head of State following the resignation of Mugabe before being elected in the elections of 30 July 2018. The electoral campaign and the period after the vote were marked by tensions and violence, as the Bishops recall, who say they are worried about the "resurgence of political and social polarization before, during and after yet another disputed national election held on July 30, 2018, which culminated in the violent turmoil of August 1, 2018, during which at least 6 civilians were killed, many others injured and several properties destroyed". The Bishops say they "witness with sadness and concern the lack of hope for a united nation and a promising future because our politicians did not grasp the tangible unity and goodwill that reigned among the Zimbabweans during and immediately after the political events of November 2017". "We also witnessed with sadness and concern the fragmented and instinctive reaction of the government to the worsening of the economic situation, exemplified by the unilateral imposition of the 2% tax on the main transfer system used in the Country and the sharp increase in fuel prices of 12 January 2019, which is the direct cause of the violent demonstrations and the revolts that led to the complete closure of the main cities and rural shopping centers of Zimbabwe", the document continues.